When your site is totally unresponsive (i.e. down), it's a big deal. Oddly enough, application errors may not surface during major outages if the failure is outside of the application. That's why we built uptime monitoring into Honeybadger: in addition to monitoring your app for internal exceptions, we also ping external endpoints from multiple locations around the world to make sure it's online and responding as expected. When your site is down we can notify you via email, SMS, Slack, or any of our other myriad notification options. 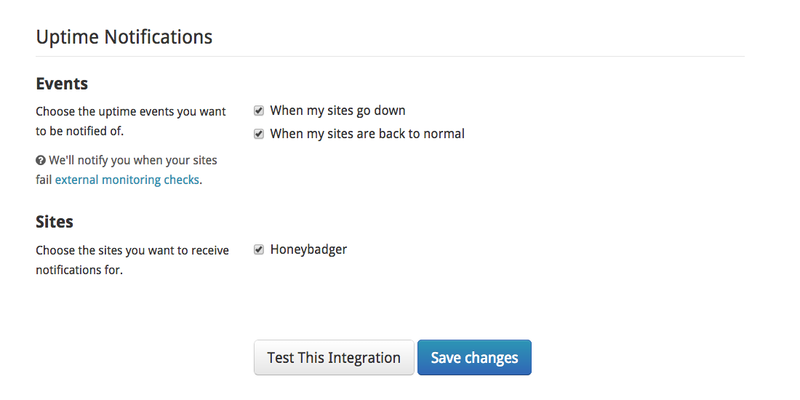 To add the WebHook integration to your Honeybadger project, visit the "Integrations" tab from your Project Settings page and find the WebHook integration. Check out this gist for the payload format which we'll post to the URL you configure. If you aren't quite sure how WebHooks work, they are basically a way to send information about events (usually in JSON format) over HTTP, which is a common language which most apps can speak. It's a great way to integrate 3rd party services in new and interesting ways. For example, when your app goes down we could send a POST request to your internal monitoring system so that it can handle notifying your ops team of the outage, do extra logging, etc. Learn more about WebHooks at webhooks.org.